The church is in the centre of town, in the same square as the town hall. 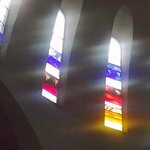 It's remarkable not for its age, because it isn't very old, but for the extraordinary harmony of the sacred space inside, and the loveliness of the modern stained glass. 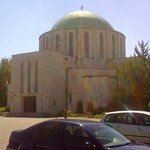 It's a Catholic church, but it recalls round, domed orthodox churches such as Hagia Sofia or Alexander Nevsky in Sofia (smaller than both of those, of course), which is absolutely appropriate for multi-faith, multi-ethnic Mohacs.